Full grain Leather Uppers with scored non slip leather soles and heels. Comes WITHOUT TAPS. 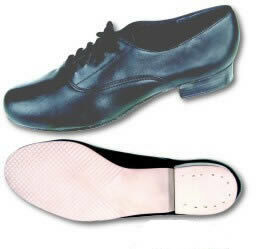 A great shoe for all types of dancing.Purchase Tru-Tone Taps or Steven Stomper Clogging taps. All in medium width whole and half sizes. Manufacturer suggests order the same as your regular street shoes size.